With the school year now in full swing, many parents find their calendars crammed full of activities. Keeping such a breakneck pace during the week makes the weekend the perfect time to relax around the house. So what do you do when you’re ready to relax but your kids keep complaining that they’re bored? 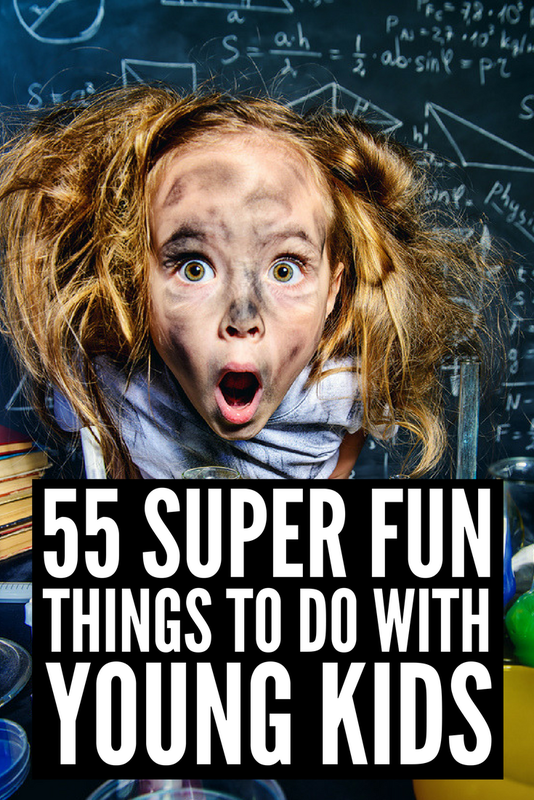 To help you out, we’ve compiled a list of over 50 super fun things for kids to do at home! 1. Get things started by making a sweet treat like these homemade gummy snacks from Healy Eats Real. 2. Get outside for some fun in the sun with these outdoor winter activities and these outdoor summer activities. 3. Break out the devices for some educational apps and games! Check out this great list of educational apps and this list of smart toys your kids will love! 4. Get crafty with this list of kid’s craft ideas by craftbits.com. 6. Grab blankets, chairs, and whatever else you can find and construct the ultimate fort in the living or play room! Turn off all of the lights and use flashlights to see inside. 7. Make these folded paper bracelets by Picklebums. 8. Go camping in your backyard and do lots of great activities as a family. From setting up the tent, to cooking marshmallows under the stars, you’re in for lots of great family fun! This Camping Activity Book for Families is a great book to give you some inspiration! 9. Make your own quicksand using this recipe by Science Kids. 10. Make your own movie. 11. Turn your living room into a theater! Pop some popcorn and grab blankets. Bundle up together on the couch and show a few great movies the whole family will love. 12. Make marble art with nail polish like Pink Stripey Socks. 14. Too cold to eat outside? Grab some blankets and have an indoor picnic! 15. Play a classic board game like Monopoly, Connect4, or Scrabble. 16. Make this DIY Ninja Warrior Course by Frugal Fun for Boys and Girls. 17. Grab a few friends and play a classic game of Hide n Seek! 18. Turn on the tunes and have a dance party or get some exercise with a great Zumba workout. Check out this list of kids Zumba hits to get you moving! 19. Splurge on a karaoke system for endless hours of fun! 20. Cook up one of these great recipes for kids over on Delish. 21. Make some of these DIY Sock Puppets by Handmade Charlotte. 22. Make jewelry with this mermaid jewelry making kit. 23. Make your own music video! 24. Grab instruments, pots and pans, and make some of these homemade noise makers by Fun 365 and create songs or just fun rhythms to dance to. 25. Make some of this 3 Ingredient DIY Foam Paint byDabbles and Babbles. 26. Try some of these fun painting ideas for kids from The Artful Parent. 27. Check out this great list of 45 craft ideas to make with kids by Happiness is Homemade! 28. Let your kids soak in a looooooooong bubble bath. 29. Put the kids in their swimming suits, grab some bath bombs, toys, paints, and bubbles and let them make a mess in the tub! 30. Make this Gingerbread Slime Recipe by Natural Beach Living! 31. Make Your Own Fizzy Lemon Drink using this recipe by Science Kids. 32. Follow this instructional post on Parents to perfectly tie dye a shirt! 33. Plant your own garden outside! Include vegetables or just pretty flowers. Kids will love getting their hands dirty! 34. Make Homemade Giant Bubbles – this Happy Hooligans is pretty amazing! 35. Have you ever tried this Diet Coke & Mentos Eruption Experiment by Science Kids? It looks really fun! 36. Go on a bug hunt and see what kinds of creepy crawlies you can find. Put them in one of these Critter Cases so you can study them! 37. Play dress up and have a tea party. 38. Look through family photos to see what family members looked like long ago, or what kids looked like when they were babies. 40. Play a good ole fashion game of jump rope! 41. Play with chalk. Outline your friends and then draw a picture of what they look like. Give the life-size chalk versions shoes, clothes, and a hat to match! 42. Grab as many sticks, leaves, and building materials as you can and attempt to create a shelter that could protect you from rain and sun. 43. Immerse yourself in another culture by picking up a few words of a different language. 44. Bake Perfect Chocolate Chip Cookies using this ahhhhhhmazing recipe by The Baking Chocolatess. 45. Rainy weather got you stuck inside? Check out this list of 25 indoor exercise activities by Mommy Poppins. 46. Have fun with LEGO – here are some LEGO ideas to inspire you! 47. Make Kool-Aid Candy with this recipe from Smart School House. 48. Read one of these books all kids should read! 49. Write a story together. 50. Invite your kids’ friends over for a themed play date. 51. Use stationery to write special letters or cards to the family members you haven’t seen in awhile. 52. Play this Nature Hunt Bingo game by Bitz & Giggles. 53. Lay outside in the grass and watch the clouds go by! Try to pick out funny shapes and see if family and friends can see the same things. 54. Grab a pair of inexpensive white shoes, markers, and puffy paint and make your own design! 55. Grab your iphone or camera and make a movie! Upload it to your computer and add special effects then view it on the TV with some popcorn! There are lots of fun things for kids to do at home on weekends, school vacations, and bad weather days. It just takes a bit of creativity to find something your little ones enjoy. I hope this list provides you some inspiration to make your next day at home a fun one! If you liked this collection of fun things for kids to do at home, please share this post on Pinterest! And if you’re looking for more ways to have fun, please follow our Kids board where we share all kinds of great ideas!